Even in this world of celebrity there are few living humans who are guaranteed a place in history along side Da Vinci, Mozart and Galileo (Hawking's personal hero). 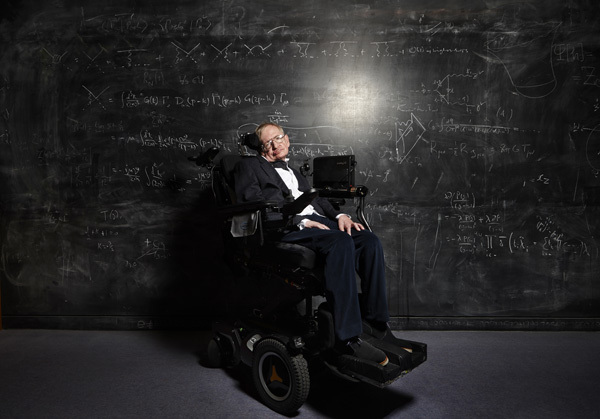 This shoot was organised very precisely as there is a limit to Hawking’s physical energy and whilst we are used to seeing Hawking alone, he has a huge team both personally and at Cambridge University that enable him to exist in any normal way inn the world that we would understand. I invited him infront of the famous Cambridge blackboard wall from floor to ceiling, centred within a chalk and board universe of his own making, a reality re-shaped by his theories. The flash reflecting like a super nova off the surface as Hawking is held in the gravitational pull and orbits in his chair. A space man impotent without the technology to keep him alive in this hostile environment, allowing him to explore the wonders of the universe. How do you communicate the incredible genius as well as the normalcy of a person in a moment especially when the parameters for reading the personality are altered from the convention? When photographing people with disability it is essential not to expect conformity to the aesthetics of the ‘everyday’ world. The visual processes that we use to define personality do not apply and when we try to force 'a square peg through a round hole' we are at risk of patronising and mis-communicating the reality of a person’s life. No matter how masking of the personality the disability is, we must find a way to communicate humanity equal to ourselves. Thanks especially to BBC and The National Portrait Gallery for their unwavering trust and faith and Prof Hawking and his amazing team for their openess and enthusiasm.